When I was first asked to review this pair of Everlast gloves, I was skeptical at first. To start this story at the true beginning I need to explain why my previous experiences with Everlast gloves could be summed up as… less than satisfactory. I owned a budget pair of their lower-end Protex model gloves and they were honestly the worst pair of low-quality monstrosities I had ever owned. One fateful day I was blocking a punch while sparing someone who was a good deal bigger than I was and his punch loosened the flimsy elastic band that fastens the glove. The glove slipped off my hand towards my face with his fist directly behind it and I ended up getting my nose broken far worse than I ever had before. After throwing all of my heavily blood stained gear in the wash that night, I vowed to never use Everlast gloves again. Well, here I was looking down at the dreaded sideways “E” logo on the back of the red and white gloves that had just arrived on my doorstep, and let me just say, I’m going to spend the rest of this article eating my words against this company. These gloves are great. While Everlast is a well-established company when it comes to their high end gloves, attempting to create a Mexican style glove was still a bold move. Mexican companies like Cleto Reyes have spent generations perfecting their unique style of gloves and fans of them tend to be loyal to a fault. It turns out that my skepticism was unfounded as these gloves are certainly among my favorites. That is not to say that there are not a few faults, though. Keep in mind that these are the 10oz pro fight gloves and not the standard training variety. While this makes a difference in how they are constructed, and many internet rumors state that they are made for a single fight and not to suffer from constant abuse, let me squash those rumors right now. I have put months of abuse on these Everlast MX Pro gloves and they have held up beyond my expectations. The gloves were shipped from Everlast in a small, nondescript box and wrapped tightly in kitchen style plastic wrap. Upon removing the plastic, I was immediately stuck with how unique these gloves were. Despite my original thought that Everlast’s strategy would be to emulate the best aspects of other Mexican style gloves, it was immediately obvious that this wasn’t the case. Rather, Everlast started with the base qualities that make the Mexican style glove so beloved and attempted to improve upon them with a modern spin. To put it bluntly, every aspect of these gloves were constructed with the goal of transferring the maximum amount of power with very little regard to the safety of your knuckles. The gloves are a nice two tone red and white and for the most part are fairly minimalist and understated. The exception to this is the shiny red “HECHO EN MEXICO” and Aztec style eagle stamped directly on the back of the wrist, the white MX and Aztec style eagle stamped on the side of the thumb, and the shiny red “Choice of Champions” stamped on the underside. The shiny red stamps were obviously pre-faded from the factory to give them a more “exotic” look. Overall I like the basic and simplistic look of these gloves, but, that being said, I do think that Everlast was trying a bit too hard to overemphasize the fact that these are Mexican gloves. When you put pre-faded Mexico stamps on your gloves to give them a “homemade from Mexico” feel, it ends up appearing more desperate then authentic in my opinion. Sort of like buying those pre-shredded jeans that started being marketed in the 90’s. I feel that quality is something you prove with the product itself and years of consistent quality control, and that attempting to ride on the coat tails of famous Mexican manufacturers only cheapens the experience and insults a potential customer base. The attention to detail that was put into these gloves is astounding. 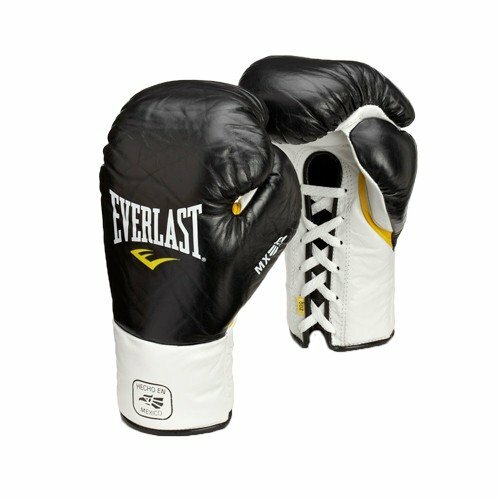 According to Everlast, the unique wrinkled look of these gloves is due to the use of Piel Planchada leather which is a luxury leather that is not often used in the construction of boxing gloves. Supposedly the use of such leather maximizes power transfer when punching. I am not a physicist, but I would have to suppose that the increased power transfer stems from how this particular leather wrinkles, how supple and expandable it is, and how durable it is. When a punch connects, the wrinkles probably flatten out and expand the surface area of the glove, essentially giving you the contact area of a much larger glove while being able to maintain the small profile of a typical Mexican style boxing glove. The lacing on these gloves, even when tightened all the way is fairly loose and doesn’t offer a lot of wrist support. After tightening the gloves all the way I could still easily fit my unwrapped hand into it. My solution to this was fairly simple, I swapped the standard nylon laces with elastic laces and simply wrap my wrists more heavily when using them. I somewhat prefer this method since it means that I can put on and take of my own gloves without anyone having to assist me in tying them. There is a seam between the wrist padding and the main glove so it does offer some resistance against your wrist moving backwards, but it is very minimal. The padding in the main glove is actually a twist on a Mexican classic. Traditionally Mexican gloves use horsehair for padding and while many Mexican training gloves have moved on to the more conventional foam padding, the vast majority of the Mexican higher end pro fight gloves still use traditional horsehair. The Everlast MX Professional Fight Gloves uses a hybrid of foam and horsehair padding and it works amazingly well. The padding over the last three knuckles consists of thin horsehair that allows you to actually feel the contours of your knuckles through the glove. Over the top and side of the index knuckle there is a thick foam pad that protects you from injuries if you happen to land your punch incorrectly. The way that the foam strip contours and transitions smoothly from the horsehair actually forces you to land your punches correctly, and this is the first pair of gloves I have ever seen that do that. The thin padding bends easily which also allows you to easily make a solid fist, which is one of the main reasons I love Mexican gloves. I feel that all boxing gloves fall on a spectrum with one end being “Maximum Protection” and the other side being “Natural/Bare Hand”. When you throw a punch with no gloves or wraps it feels the most natural, but you are more likely to get hurt. When you wrap your hands, suddenly your fists feel more solid and brutal while still feeling light and natural. I consider this the sweet spot between protected and natural, the only downside being that there is no impact protection, just structural protection. When it comes to boxing gloves the reason I prefer Mexican gloves is because they fall nearest to fighting with just wraps as opposed to their bulkier counterparts that offer more protection, but feel like I’m trying to win a pillow fight. What many people don’t realize, though, is that boxing gloves were first invented to protect your knuckles, not the other guy’s face, and, in fact, there have been more deaths from boxing after the implementation of gloves than in the days of professional bare-knuckle boxing. This is because the extra padding allows you to throw punches harder and allows for more and harder punches to the head, which was previously a risky target that had more potential to hurt your hand than the other guy. When you start to sacrifice protection in the name of power transfer, you start to play a risky game. When you throw a lot of punches with little protection, your hand starts to take damage over time. The more damage your hand takes, the less structural integrity your fist has and the less effective punches you are able to throw. If you have ever had a knuckle injury, you probably already know this. Your arm strength is still all there, but you can’t throw a punch nearly as effectively as when you are healthy. The reason that all of this is important is because I wanted to emphasize that these gloves do an outstanding job of achieving a balance very near the aforementioned sweet spot, while still offering outstanding protection. That being said, that protection is still very far on the “Natural/Bare Hand” end of the spectrum, and if you are prone to wrist or hand injuries, these gloves are not for you. I previously stated that I have put months of wear on these gloves and they barely show it at all. That being said it is true that they are on the somewhat steeper side of the spectrum for what they are. For the same price you could pick up a pair of actual Cleto Reyes pro fight gloves. The thing to remember is that, despite how Everlast is marketing them, these gloves are not knock-offs of the tried and true Mexican brands. They are a unique creation all of themselves and, in my opinion, are worth completely worth the price tag. We thank the nice people at Everlast for providing us with Everlast MX Boxing Gloves. This did not influence the outcome of the review, which was written after several months of training. I absolutely adore this gloves and they are currently one of the top 3 pairs of gloves I have ever owned. Jack Biltson is a boxing and sports enthusiast who buys too much gear and likes to talk about it. He fought in his first tournament in 2010 and is a qualified fitness instructor.